This second volume is concerned with the changes that are needed to improve the matching of health services to the needs of these groups. Its chapters analyse work on ‘cultural competence’ in the USA and Europe, as well as the use of interpreters and cultural mediators to overcome linguistic and cultural barriers. Other topics covered include user involvement, services for unaccompanied minors and Roma communities, the relation between NGO’s and mainstream services and the incorporation of non-Western approaches in Western health care. The final section of the book examines the health aspects of irregular migration in the Mediterranean region, viewed in the context of the complex political, legal and human rights issues that this phenomenon raises. 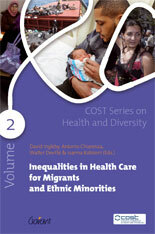 "Volume 2 offers the reader a great deal of insight and experience from a range of perspectives and national contexts to inform thinking and response to migrant people’s health needs. It is to be recommended for anyone wishing to extend their understanding beyond the boundaries of their own national experience." Richard Bryant-Jefferies, Head of Equalities and Diversity, CNWL NHS Foundation Trust.